President Donald J. Trump will deliver his first State of the Union Address to a joint session of Congress tonight at 9:00 PM Eastern Time. The event will be carried live on every TV channel and Web platform in the known universe. We can expect the same kind of dubious, vacuous, self-aggrandizing sales pitch Mr. Trump recently delivered to real world leaders and business titans in Davos, with a dab of “Build the Wall” (billed as “security”) added to appease his base supporters. Things will get more interesting after the speech, during the inevitable GOP spin sessions and Democratic responses by Rep. Joe Kennedy (D, MA-4), Rep. Maxine Waters (D, CA-43), and Virginia State Delegate Elizabeth Guzman (D-Prince William). 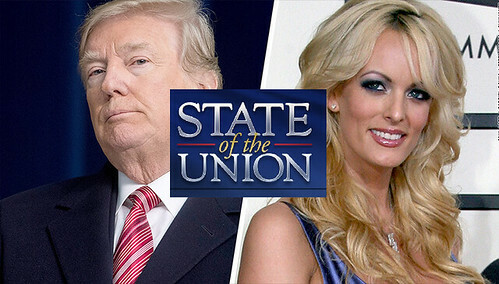 But more Americans will be watching the response of adult film star Stormy Daniels, who will be a guest on ABC’s Jimmy Kimmel Live following the State of the Union. Ms. Daniels received $130,000 in hush money from Trump in 2016, one month before the election, for staying silent about her affair with Mr. Trump. For the record, Stormy Daniels (Stephanie Clifford) is a Republican and a working Mom. This entry was posted on January 30, 2018 at 8:00 am and is filed under politics. You can follow any responses to this entry through the RSS 2.0 feed. You can leave a response, or trackback from your own site.